Now that I’m a student, and I can get to all my classes and volunteering by train and such, I’ll be selling my car. Of course, I figure I’ve got to fix the car up enough so that the Check Engine light stays off first. And then it’s all Zipcar, BART and biking for me. So I bought a bike. At $630 complete, It should pay for itself in the first month or two of not having a car (my car costs about $600/month to own!). 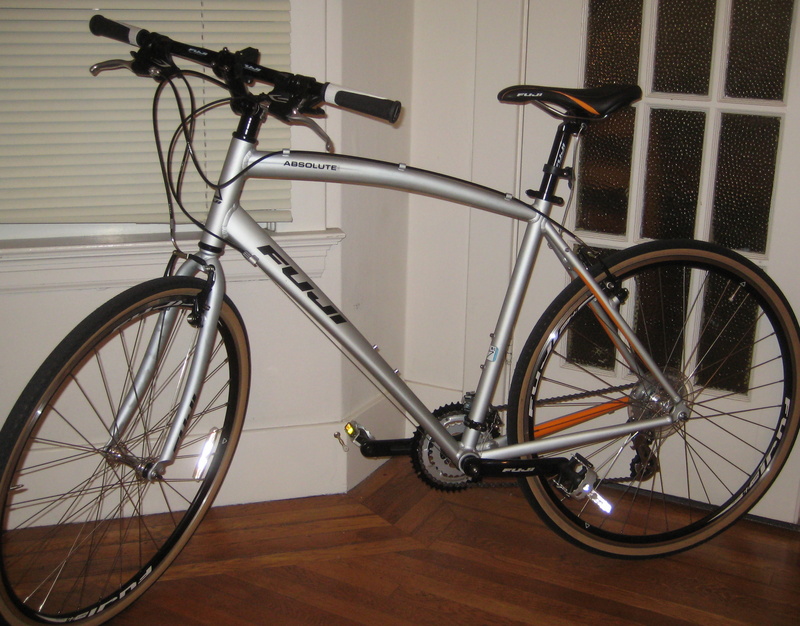 Body: 2011 “Fuji Absolute 3.0″ hybrid. Color: Grey with orange on the inside of the chain stays and underside of the seat stays. Serial ICFU12I01883. That serial number could be mistaken for ICFU12IO1883. 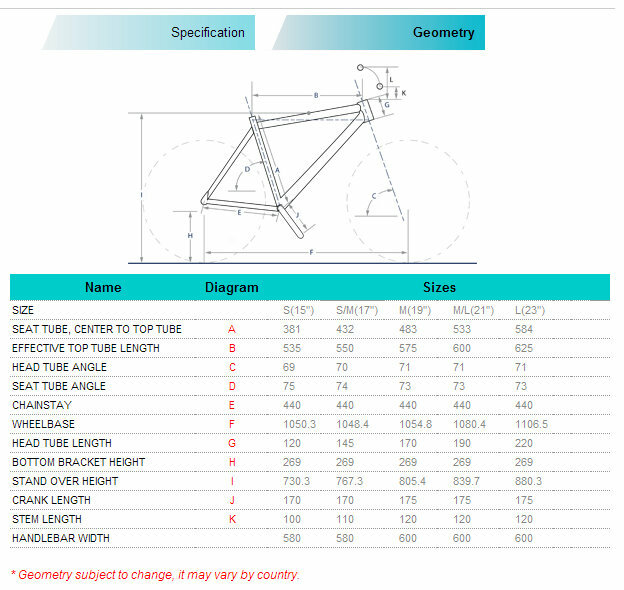 21″ frame. 23.6” back to front. Aluminum. Seat: Black with an orange swish. It is secured to the frame with a length of wire. Wheels: “Fuji Aero-V 25 700C/622 Etrto”. Both the front and rear wheel are secured with Pinhead Locks locking wheel hubs. Update 2/13/13: I also got a Pinhead seat post lock and saddle lock. And apparently a Gator Grip tool can defeat these locks so Pinhead now gives away a locking washer thing on their website that prevents that problem. Tires: “Panasonic Panaracer Pasela Tourguard 700x32C”, black with tan sidewalls. Update 8-21-13: Rear tire is now a Continental Touring Plus 700Cx32, black with black sidewalls and a reflective tape. Kickstand: On 8-23-13 I added a Greenfield Rear Mount Stabilizer Kickstand, adding 14 ounces to the bike. I tried adding a regular Greenfield kickstand but it had the same problem that ALL regular kickstand have, all the way back to when I was a kid: no matter how hard you tighten it down, the mount sometimes swivels on the bike, messing everything up. Rack: made by Axiom, mostly to hold my Kryptonite lock. I’ve registered the bike on Bikeshepherd.org and I got the 30 year registration with the National Bike Registry. Yowza, will they even have bikes in 2042? Or will we all have jet packs? The new bike was actually quite a step down from my old bike. The steering was loose such that it was best to not steer too quickly, the front brake had virtually no grab, the handlebars had rolled down into an awkward position, the bike was several inches too small for me (I had extended the seatpost to it’s limit to no avail), it had big inefficient knobby tires, the rear brakes only worked moderately well, and it had been spray painted (partially and poorly) an awful shade of brown. That is how I rode it on the playa and that is pretty much how I rode it for 2 years. It’s a good thing I didn’t ride it often, otherwise, I’d be dead now. It is now terrorizing some kind soul at the San Francisco bike kitchen. 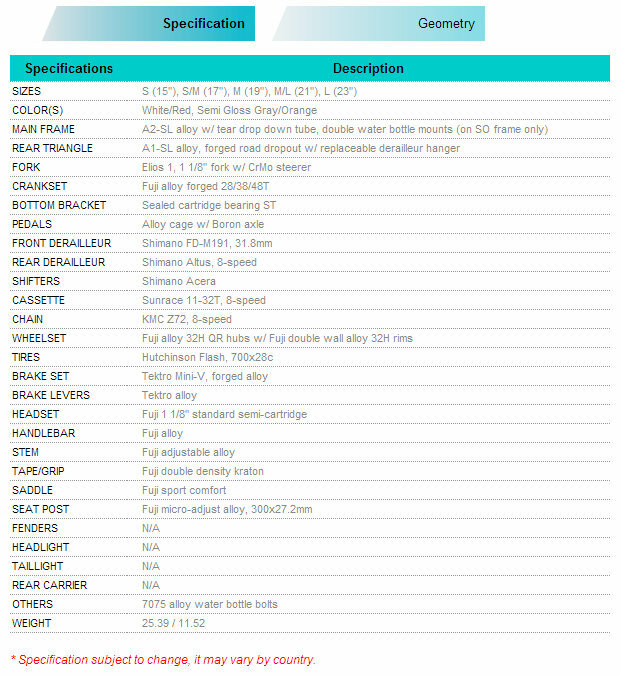 Specs from the Fuji Bikes website. I’ve heard of folks preventing bike theft by ugly-ing down their bike: wrapping it in duct tape, spray painting it blobs of ugly primer colors, etc. Painting it ugly will just mean I get to ride an ugly bike til it gets stolen. 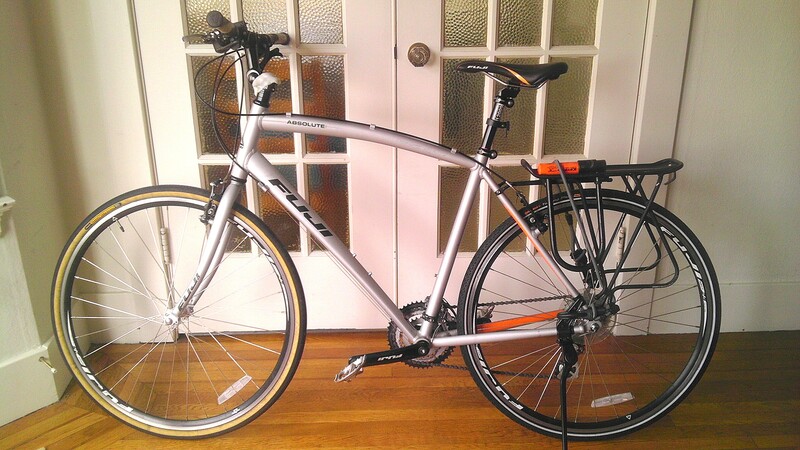 I have to say I used to own a sweet cannondale when I lived in SF. Bought not from crack heads, but rather industrial upper middle class teens supplementing their allowance to buy nugs in the panhandle. They’d steal bikes from their neighbors, ride them to the panhandle and trade…$75 wholesale nugs got one a $1000+ bike easy back in the day. And when it was stole, I wasn’t upset! And that is how the world works. I need a second lock. And a claymore. YAY!!!!!!!! Can’t wait to park it at the next SFBC thang, ha! I’ll look for you in the bike lanes soon! Alexis, how do you get to work? Train or bike? @Biking Around: Thought the green wave on Valencia was 13 mph? Hmm, the internets says it’s a 13mph green wave but I know that I drive my car at 15 mph down Valencia; maybe my speedometer is off. Pedal Revolution. They were great. I’ll try to gauge the speed with the GPS on my phone sometime. Nice. It’s a bit slow on the downhill and a tiny bit fast on the uphill. I need one of those remotes the cops have to change it to my will!! I love your bike!!! I was just looking at the exact same model on bikedepot.com for $399. Do you think that its worth it and how is yours holding up?? * I adjusted the handlebars all the way up because I’m lazy and like to sit upright. Which is also to say that I’m glad they are adjustable. * I’ve had 1 flat tire in about 300(?) miles of riding with the puncture resistant tires I got. * Sometimes when I’m pushing the bike by hand the pedals advance like 1/2 a revolution. I think that’s a sign it might want a little oil. I’ve oiled the chain twice… eh, I’m not too worried.